To Cite: Gholami M, Darvish H, Ahmadi H, Rahimi-Aliabadi S, Emamalizadeh B, et al. Functional Genetic Variants of FOXP3 and Risk of Multiple Sclerosis, Iran Red Crescent Med J. 2017 ; 19(1):e34597. doi: 10.5812/ircmj.34597. Background: Multiple sclerosis (MS) is an autoimmune disease that affects the central nervous system (CNS). MS is one of the most common cause of neurological impairment at a young age with a complex etiology. The forkhead/winged helix (FOXP3) gene encodes a transcription factor that plays an important role in the working and progress of regulatory T cells. Loss of the FOXP3 function impairs the suppressor activity of regulatory T (T-reg) cells, which have been reported in MS patients. Objectives: To determine whether rs2232365 and rs3761548 polymorphisms of FOXP3 are associated with the risk of MS in an Iranian population. Patients and Methods: In this case-control study, a total of 384 samples consisting of 190 MS patients and 194 unrelated healthy subjects from the Iranian population were recruited between December 2014 and September 2015. The patients were diagnosed by a neurologist based on McDonald’s criteria. The control group had no history or presence of autoimmune diseases. The polymorphisms were genotyped using tetra-ARMS PCR and PCR-restriction fragment length polymorphism (RFLP) techniques. Results: The Rs2232365 G allele was significantly associated with an increased risk of MS (P = 0.0068). In contrast, the allele and genotype frequencies of rs3761548 was not significantly different between the case and control groups (P > 0.05). Conclusions: The functional variant of the FOXP3, rs2232365 A/G, may be considered a substantial risk factor for MS. Multiple sclerosis (MS) is one of the most common chronic inflammatory and autoimmune diseases that affect the brain and spinal cord. It is believed that the disease results from a complex interaction of a variety of genetic and environmental factors (1). MS is caused by damage to the myelin sheath in the central nervous system (CNS), which destroys the axons and the myelin at different levels of severity (2). Neurologists have concurred that MS patients may be classified into four groups according to the development of the disease: Relapsing-remitting MS; Secondary progressive MS; Primary progressive MS; and Progressive-relapsing MS (3). MS is particularly prevalent among young adults; approximately 90 percent of MS patients are under the age of 55, but it can be seen at any age, though fewer than 5 percent are diagnosed before the age of 14. MS is more common (2 - 3 times) in females (4). The prevalence rate of MS in Iran was determined as 45 in 100,000 of the population, and 70 percent of these patients were between 20 - 40 years of age (5). The basic molecular mechanism of MS still needs to be elucidated, and its ambiguous mechanisms suggest that the moderate involvement of genetic factors in multiple risk loci may affect the promotion and progression of the disease (6). Among some of the human autoimmune diseases, CD4+ CD25+ high T-regs functional deficiency appears to be common. Previous studies have reported T-reg deficiencies in MS patients, type I autoimmune diabetes, and psoriasis (7-9). The FOXP3 gene is mapped to chromosome Xp11.23. Likewise, FOXP3 is considered a member of a gene family which encodes transcription factors occupying a winged helix or forkhead box (‘fox’) DNA binding domain (10). Forkhead box P3 (FoxP3) plays a pivotal regulatory role in the evolution and performance of T-reg cells (11). FoxP3’s collaboration with the nuclear factor of activated T cells (NFAT) controls T-reg functioning, and deficiency of the FoxP3 gene (FOXP3) impairs the inhibitory function of T-reg cells (12, 13). In humans, germ line inactivating mutations of the FOXP3 gene cause immunodysregulation, polyendocrinopathy, enteropathy, X-linked (IPEX) syndrome (14). Polymorphisms in the FOXP3 gene have been suspected of playing a role in various diseases. Several earlier studies have shown an association between FOXP3 gene variations and autoimmune disorders, including systemic lupus erythematosus (SLE) (15), autoimmune thyroid diseases (AITDs) (16), type I diabetes (TID), and allergic rhinitis (17). Hence, it is necessary to investigate the effect of functional FOXP3 polymorphisms on MS susceptibility. In the present study, we focused on rs2232365 (for the first time) and rs3761548 polymorphisms of the FOXP3 gene to investigate whether they are associated with the susceptibility and risk of MS in Iranian patients. Since allele prevalence is unknown in the Iranian population, the P number is 0.5, d is 0.08, Z is 1.96, and the confidential interval is 95 percent. According to this formula, the minimum sample size should be 150 cases and 150 controls. To enhance the power of the study, we increased the subject number. Thus, a total of 384 samples consisting of 190 MS patients and 194 healthy subjects were included in our case-control study. All patients and controls were unrelated and Iranian. Subjects were obtained from the pathology department of Sina hospital, (affiliated to Tehran University of Medical Sciences), Iran, between December 2014 and September 2015. The existence of MS was determined by an expert neurologist on the basis of clinical and para-clinical examinations according to McDonald’s criteria (19). Patients who could not be clearly diagnosed as having MS and those who were not willing to participate in the study were excluded. The patients had RRMS (n = 152), SPMS (n = 26), PPMS (n = 8) and PRMS (n = 4) patterns of the disease. The exclusion criteria for the control group were: active MS; disorders such as asthma, allergic rhinitis, recurrent infections, or atopic diseases; personal or family history of autoimmune diseases; cancer; and corticosteroid treatment during the last four weeks. Cases and controls were matched according to age and gender (Table 1). Written informed consent was obtained from all participants and the study was approved by the ethics committee at Shahid Beheshti University of Medical Sciences (ethics code: SBMU.REC.1393.610). Genomic DNA was extracted from a peripheral using a standard salting out method. Genotyping of rs2232365 was conducted using a tetra-primer amplification refractory mutation system-polymerase chain reaction (tetra-ARMS PCR, Table 2). The genotype of rs3761548 was determined using a polymerase chain reaction-restriction fragment length polymorphism (PCR-RFLP) method. PCR reactions were performed on a GeneTouch Thermal Cycler (BIOER Company) in a volume of 15 μL, containing 100 - 300 ng of genomic DNA, 0.1 - 0.5 µM of each primer, 7.5 μL of Red Load Taq Master (Jena Bioscience, Cat. No. PCR-113S), and 5.5 μL of ddH2O. The PCR condition was initial denaturation at 94°C for 4 minutes, followed by 35 cycles of 94°C for 45 seconds, annealing temperature (54 for rs2232365 and 58 for rs3761548) for 45 seconds, and 72°C for 55 seconds, with the final extension of 72°C for 5 minutes. The PCR products of rs3761548 then underwent a RFLP reaction with restriction enzyme Pst1 (Jena Bioscience, Cat. No: EN-127L), and were incubated at 37°C for 3 hours (Table 3). 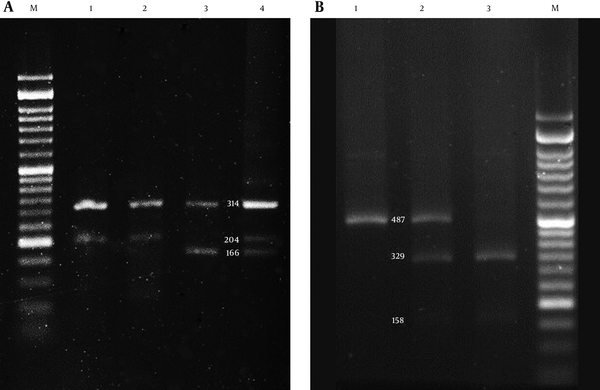 The amplified PCR and digested products were analyzed using 2 percent and 3 percent agarose gel electrophoresis. To ensure that the results were repeatable, a 5 percent specimen of the subjects in the patient group and the control group were genotyped twice, and the reproducibility was 100 percent. Genotype frequencies were tested for Hardy–Weinberg equilibrium using a Fisher’s exact test. Pearson’s chi-squared (χ2) tests were applied for analyzing genotype and allele frequencies between the case and control groups, and a P value less than 0.05 (two tailed) was considered significant. Genotype frequencies were also analyzed under dominant and recessive genetic models using SNPSTATS online software. Unconditional logistic regression was applied to estimate the risks associated with each SNP, with a 95 percent confidence interval (CIs). No deviation from Hardy-Weinberg equilibrium was observed in the genotype distributions of the MS patients and controls. All samples were genotyped successfully for both SNPs (Figure 1). The allele frequency of rs2232365 was significantly different between the case and control groups, and the G allele was more prevalent in MS patients (69 percent vs. 59 percent, P = 0.0068) (Table 4). The difference was also significant under dominant and recessive models [odds ratio (OR) 1.7, 95 percent confidence interval (CI) 1.00 - 3.02, P = 0.0498] and [odds ratio (OR) 1.58, 95 percent confidence interval (CI) 1.05 - 2.37, P = 0.0256]. The overall genotype and allele frequency distribution of rs3761548 were not significantly different between MS patients and the controls (P > 0.05). A, Is the band pattern for rs3761548. Lane 1 indicates A/A genotype; Lane 2 indicates A/C genotype; Lane 3 indicates C/C genotype. B, Is the band pattern for rs2232365. Lane 1 & 2 indicate A/A genotype; Lane 3 indicates G/G genotype; Lane 4 indicates A/G genotype. M represents 50 bp DNA marker. Recent studies have discovered that FoxP3 targets genes in developing T-regs, also indicating that FOXP3 functions as a master regulator (transcription factor) in the evolution and operation of CD4+CD25+ T-regs (20, 21). T-regs control both adaptive and innate immune responses through different pathways, especially the suppression of CD4+ T-cells through competition for interleukin-2, inactivation of CD8+ T-cells through cell communication and transforming growth factor-β, and reduction of inflammation through secretion of interleukin-10 (22, 23). The absence of functional CD4+CD25+ T-regs may be caused by a deficiency of FoxP3 (24). Studies have demonstrated that a significant decline in the effector functions of this regulatory T cell population were observed in MS cases compared to healthy donors (11). Therefore, we hypothesized that FOXP3 polymorphisms might be involved in the pathogenesis of MS via quantitative and functional influences on CD4+CD25+ T-regs. Genetic variants in the promoter region of the FOXP3 gene may change its expression. A number of SNPs in this region containing rs3761548 and rs2232365 have been reported in different ethnic groups dealing with various human diseases (25). The role of two important polymorphisms, rs2232365 and rs3761548, in various autoimmune diseases has been reported previously. To our knowledge, our report is the first retrospective association study of rs2232365 with MS; however, the rs2232365 G allele was considered a risk factor for URSA. URSA in females with the G allele was higher compared to those carrying an A allele, which is also consistent with our results (26). Moreover, an investigation of Type I diabetes patients showed a greater occurrence of beta-cell failure in those carrying a G allele (27). Similarly, the rs2232365 GG genotype was considered a risk factor for vitiligo patients in a Han Chinese population. Indeed, significantly increased vitiligo risk was associated with the rs2232365 GG [odds ratio (OR) 1.68, 95 percent confidence interval (CI) 1.17 - 2.39, P = 0.004] (28). Another study demonstrated that the frequency AA and AC genotypes of rs3761548 are significantly higher in MS patients than healthy subjects (29). Another study in a South India population reported that C alleles in rs3761548 are associated with susceptibility to pre-eclampsia (30); nevertheless, these two studies are inconsistent with our results. However, a study of Italian patients with systemic sclerosis revealed that allelic and genotype frequencies of rs3761548 are not associated with this disorder (31), which is consistent with our study. Our case-control association study for the FOXP3 variant showed that rs3761548 does not seem to affect the risk for MS, whereas the rs2232365 G allele (for the first time on MS patients) may confer a susceptibility to MS for their carriers. Previous studies have shown that the GATA-3 transcription factor plays a key role in the Th2 immune function. Specifically, when the G allele of the rs2232365 FOXP3 gene exists, GATA-3 cannot bind to the promoter region of FoxP3 (32). Therefore, the gene expression of FOXP3 is diminished, along with a decreased number of T-regs. T-reg cells modulate the Th1/Th2 cell balance toward Th2 cells. Hence, we deduced that a deficiency in the Th2 immune function might be caused by the existence of the G allele and G/G genotype, which may lead to a Th1/Th2 imbalance, and subsequently have a prejudicial effect on the pathogenicity of MS. The small sample size was one of our study’s weaknesses, and we also could not perform a functional study of the gene expression. A definite diagnosis of MS patients, matched controls, and novel findings are our study’s strengths. MS is a multifactorial disorder because it is not caused by a single gene mutation, but by a combination of genetic and environmental factors working together in ways that are not yet fully understood. It is also possible that through an interaction with other genes, the polymorphisms of the FOXP3 gene are involved in MS susceptibility. Thus, further studies are needed to analyze the association between MS and quantitative trait loci (QTLs). To prove our hypothesis, large replicative studies are warranted among different racial populations with larger sample sizes. At the same time, it is incumbent on the clinical and research communities to press forward to model and discover MS progression. The generated information could open the window toward personalized (precision) medicine for targeted treatment and an improvement in the survival rate of MS patients. We are appreciative of all patients and control individuals for their participation in this study. The authors have no actual or potential conflicts of interest related to this manuscript. Funding/Support: This study was funded by Shahid Beheshti University of Medical Sciences, Tehran, Iran.